The Kinderdijk-Elshout mill network is an outstanding man-made landscape that bears powerful testimony to human ingenuity and fortitude over a millennium in draining and protecting an area by the development and application of hydraulic technology. It is located in the north-western comer of the Alblasserwaard. It drained the internal drainage districts of De Overwaard and De Nederwaard until 1950, when the mills were closed. The 19 mills that form this group of monuments are all in operating condition. The Alblasserwaard is bounded by the rivers Lek to the north, Merwede to the south, and Noord to the south. The properties consist of discharge sluices, Water Board Assembly Houses, pumping stations, and brick and wooden mills. Owing to changed technical requirements, the discharge sluices were reduced to two and reconstructed in the mid-1980s. The Water Board Assembly Houses of De Overwaard and De Nederwaard survive intact. The former was built in 1581 and purchased by the Water Board in 1595 to house the Elshout lockmaster. It was used for several other purposes until 1648, when it became the headquarters of the Water Board. It is a two-storeyed brick structure on a rectangular floor plan with a hipped roof. When it became the Water Board Assembly House the modifications included provision of a meeting room, addition of a stone door-arch decorated with coats of arms of the reeve and board members, new windows, and bedrooms in the attic for members. It underwent drastic alterations in 1918 when the dyke there was raised and widened: 3 m was removed from the front of the house and a new facade built. It was restored in 1981-83. The assembly house of De Nederwaard is a plain rectangular two-storeyed building of the 18th century with a hipped roof. The Wisbom pumping station was originally an auxiliary steam-driven pumping station for De Overwaard, built in 1868 with four scoop water-wheels on the exterior of the engine house. It was converted to electricity in 1924. At this time some modifications were carried out to the plain gabled brick structure. The Van Haaften pumping station, built for De Nederwaard, also dates from 1868. It was converted to diesel operation in 1927 and the scoop wheels were replaced by Archimedean screws. It was partly demolished in 1971-72 when the J.U. Smit pumping station was built. 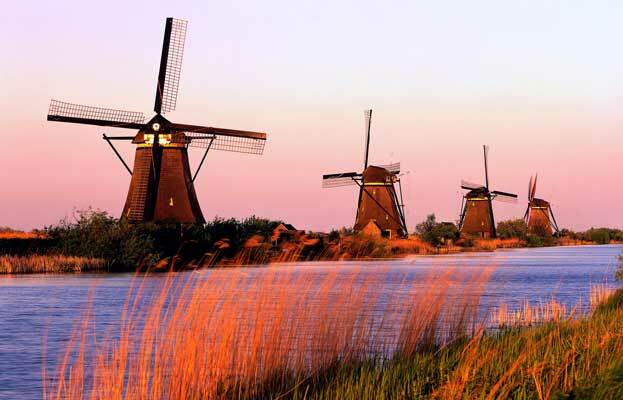 The most characteristic features of this landscape are the windmills, used to pump water from the polders using internal or external scoops into reservoirs, on two levels. At one time there were more than 150 in the Alblasserwaard and Vijfheerenlanden area; this had dropped to 78 in the 1870s but today the total is only 28, of which 16 are in the Kinderdijk area. The eight mills that survive on De Nederwaard were all built in 1738. They are bonnet mills (in which only the top section revolves with the wind), built from brick and with large sails that come within 30 cm of the ground, hence their name, 'ground sailers'. Eight mills are also in place on De Overwaard. All date from 1740 (although one was reconstructed in the 1980s). They are bonnet mills and ground sailers but, unlike those on De Nederwaard, they are octagonal in plan and built from wood on brick substructures. The internal iron scoop wheels are slightly larger than those on De Nederwaard, as are the spans of the sails. In addition to the mills on De Nederwaard and De Overwaard; the World Heritage site contains two mills from the Nieuw-Lekkerland polder and one from the Alblasserdam polder. Both of the former are of the same type as on De Overwaard, but De Hoge Molen (The High Mill) has an internal steel Archimedean screw for raising water, rather than a scoop wheel. 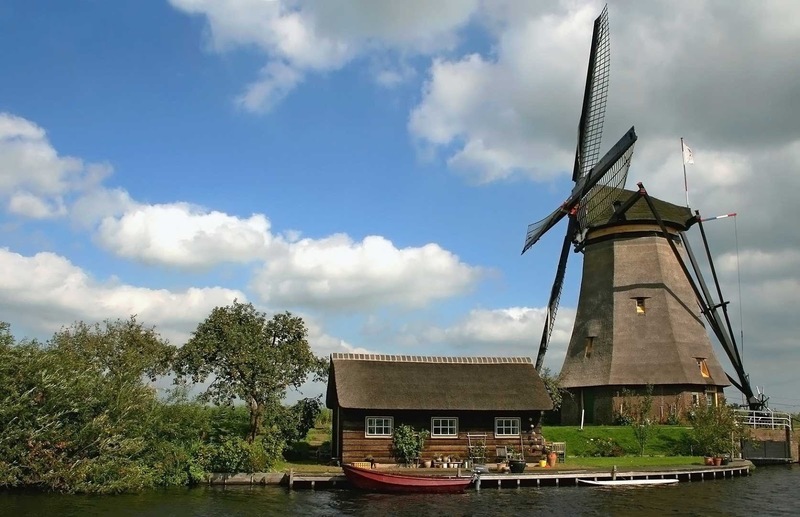 The De Blokker mill on the Alblasserdam polder is the only example in this area of the earlier form of mill, the hollow post mill, in which the upper part of the structure that revolves with the wind is considerably larger than that of the bonnet mill. The date of its original construction is unknown, but records show that there has been a mill here since the late 15th century. Although they went out of use in the late 1940s, all 19 mills are still maintained in operating condition, because they function as fall-back mills in case of failure of the modern equipment. So far as the landscape is concerned, the other most striking feature is the evidence that still survives in two areas of the medieval land-tenure system, based on long thin strip fields. This is a landscape that has not changed significantly for centuries. 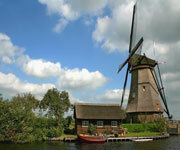 Browse All UNESCO World Heritage Sites in Netherlands. The original UNESCO inscription Here!! !